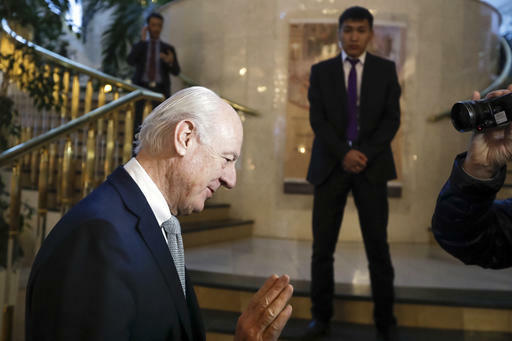 Russia, Iran and Turkey—sponsors of talks in Kazakhstan between Syria and rebel factions—pledged Tuesday to consolidate the country's nearly month-old cease-fire and set up a three-way mechanism to ensure compliance of all sides. At the conclusion of the two-day conference on Syria's nearly six-year war in Astana, the three countries said they will use their "influence" to strengthen the truce, without specifying how that would work. The statement signed by the three sponsors also says the agreement in Astana paves the way for political talks to be held in Geneva on Feb. 8, and welcomed the rebel groups' participation in the U.N. sponsored talks. Russia, an ally of the Syrian government, and Turkey, a supporter of the opposition, had negotiated the shaky Dec. 30 cease-fire. Iran, supporter of the government, had approved it. The cease-fire greatly reduced the violence in Syria. But violations continued and the Syrian opposition and the government and its allies exchanged blame. Kazakhstan's foreign minister, Kairat Abdrakhmanov, read out the final statement at the end of the meeting, which briefly brought the warring parties together in a face-to-face meeting. But the talks were largely indirect, mediated by the United Nations envoy. The meeting's final statement said the three countries "will seek through concrete steps and using the influence of the parties the consolidation the cease-fire" and agreed "to establish a trilateral mechanism to observe and ensure full compliance with the cease fire, prevent any provocations and determine all modalities of the ceasefire." The statement said the three nations will continue their joint efforts in fighting the extremist Islamic State group and the al-Qaida affiliate in Syria. They called on the opposition to separate themselves from an al-Qaida-affiliate in Syria, a sticky point that has previously been the reason for the failure of previous cease-fire. The rebel groups have formed close links with the group, known as Fatah al-Sham Front, on the ground. Tough fighters, Fatah al-Sham is excluded from the cease-fire according to the government, but the rebels say the truce should include all of Syria. Astana featured a brief face-to-face meeting between the government and rebel representatives—their first since the Syrian war began in 2011—that was quickly followed by harsh exchanges. After the final statement and in a briefing with journalists, the Syrian government delegate to the talks said the conference succeeded in consolidating the cease-fire in the war ravaged country. Bashar al-Ja'afari, Syria's U.N. ambassador who is leading the government delegation to the talks in Astana, said his government did all it could to "remove obstacles" facing the talks in Astana. Shortly before him, an opposition representative Osama Abo Zayd said the rebels had reservations about the final statement because Iran, which fights alongside the government, should not be considered a sponsor of the talks, but a party to the conflict.